Born Ruffians premiered a new video for the song “Permanent Hesitation” from the band’s latest album, Birthmarks. Watch it in the player below. The video was directed by Ron Eyal and Eleanor Burke using an 8-camera rig devised by Eyal, Burke, and D.P. Eric Lin. The multi-frame look of the video was inspired by artist David Hockney’s “polaroid composite” portraits which stitch together multiple snapshots into a single mosaic image. “Permanent Hesitation” is the first music video shot simultaneously with eight video cameras to create a unified image. The crew used eight Canon 5D Mark III’s and custom-built rig which allowed each camera to be aimed independently. The motion graphics were created by designer and animator Kristyn Hume. 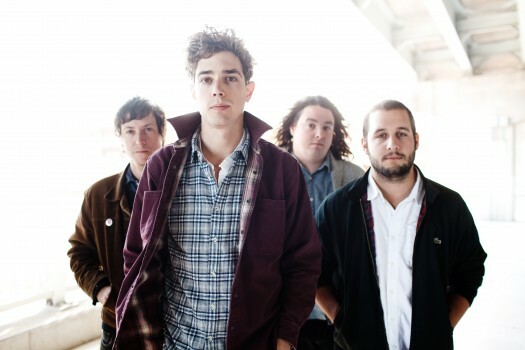 Born Ruffians need your help to record their show in Durham tonight!